Looking far more exotic and beautiful than its common name suggests, Bogbean is surely one of the most beautiful of all wetland wildflowers. 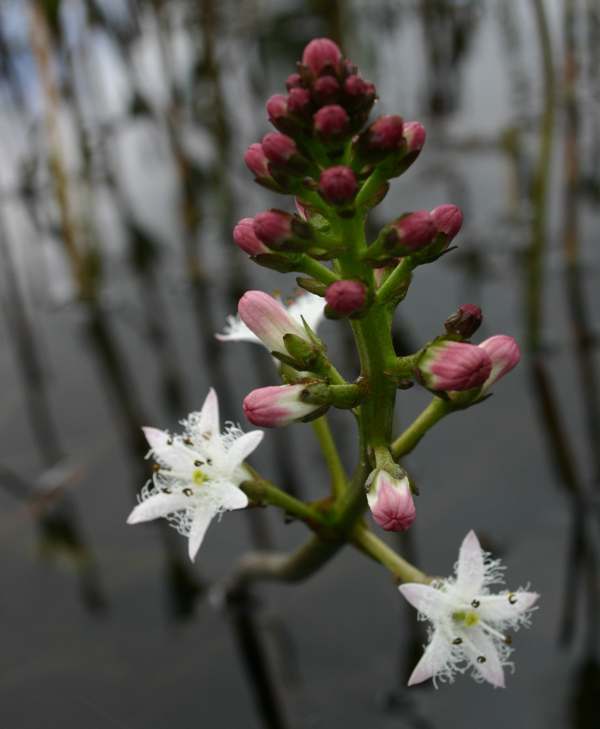 Bogbean is a most distinctive plant, especially when it is in bloom. Long, thick stems bear trifoliate leaves that individually look like the leaves of Broad Beans, and this, together with its propensity for growing in boggy ground, may well be the origin of the common name. Delicate and star shaped, the flowers of Bogbean have an amazingly intricate structure, which becomes apparent only when they are fully open. Buds of Bogbean are pink, as initially are the undersides of flower petals, but the flowers become almost pure white when they are fully open. Each individual flower has five (or very occasionally six) narrow pointed petals that are fringed along most of both edges by distinctive sprays of long white whiskers.The stems that bear the pyramidal spikes of flowers can extend to between 15 and 30cm above the surface, so that the flowers are clearly visible from quite a distance. Bogbean thrives in wet acidic soil. 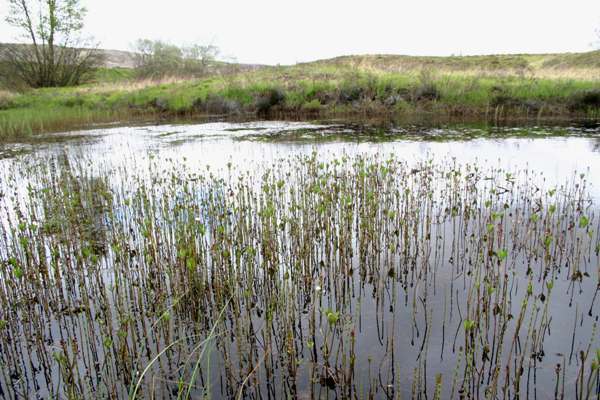 These plants thrive in shallow, low-nutrient pools, peat bogs and marshes, but any permanently damp depression in moorland is likely to be colonised by Bogbean. The leaves and flowers all show above the surface, but propagation is largely via the thick sprawling stems that extend just below the surface of the soil or, when immersed, just under the surface of the water. The stems root at nodes and produce new flowering shoots, particularly where they make contact with wet peaty land. In Britain the first flowers of Bogbean appear in March and are usually at their best in April, and in lowland sites by early May the flowers are over. In the Scottish highlands Bogbean can still be seen in flower in early June. In the past Bogbean was a popular medicinal herb and considered to be particularly valuable as a treatment for scurvy. Nowadays Menyanthes trifoliata is valued more for its ornamental value in and beside garden ponds. Bogbean is the county flower of Renfrewshire. 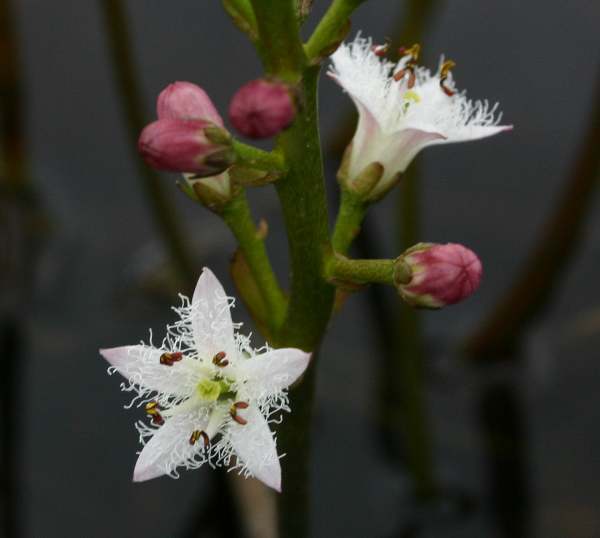 Bogbean is the only member of the Menyanthes genus and is unlikely to be confused with any other white-flowered species. 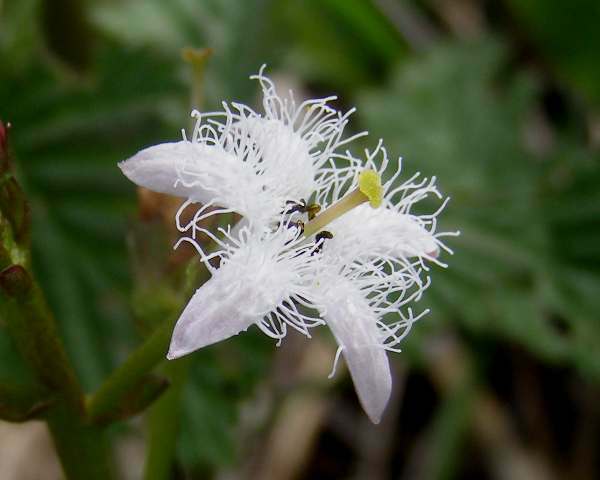 Its nearest lookalike is probably Fringed Water-lily Nymphoides peltata, which despite its common name is not really a 'water-lily' but the only other member of the family Menyanthes. With yellow star-like fringed flowers, Fringed Water-lily is hardly likely to be mistaken for Bogbean. The Bogbean specimens shown on this page were photographed in West Wales during April.